Pakistani Tehreek-e-Insaf (PTI) on Wednesday launched an official website to track the progress of the government’s administration. The purpose of this website was to show transparency in Government’s administration. 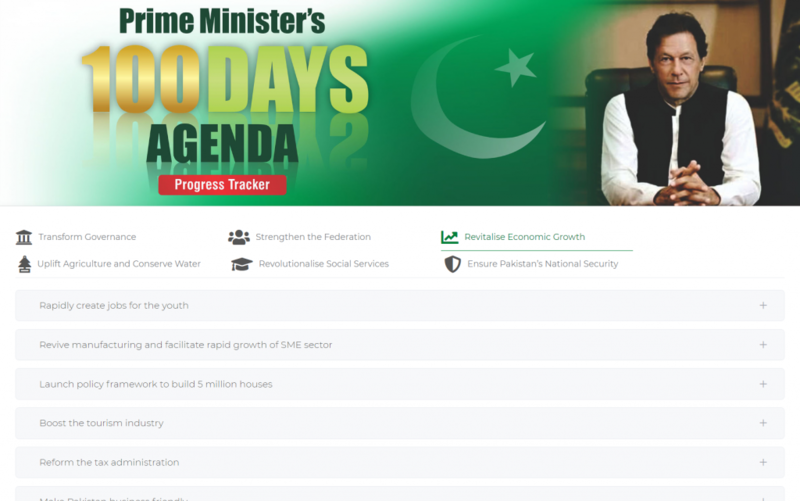 Anyone can find the website on “pm100days.pmo.gov.pk” and can track the progress of the PM’s 100 days agenda. The news was conveyed via PTI’s twitter account. Imran Khan initially revealed the 100-day agenda earlier in May before being elected for the PM office. He promised that he will fulfill this agenda in the first 100 days of his governance. Adviser to the Prime Minister on Establishment Mohammad Shehzad Arbab informed that the website PM 100days.pmo.gov.pk – has been created for the public and media to track progress on the 100 Days Agenda. “We want to be transparent. We are accountable to the public, so we have launched a website to help people keep track of our performance,” Arbab told journalists. These six objectives have been further broken down into 35 initiatives and are mentioned on the website. You can visit the website by clicking here. The website is expected to be updated regularly so that everyone can monitor the performance of the government. Interestingly this isn’t the only website that is monitoring the government’s performance and the 100-day agenda. Earlier Salman Saeed, a social entrepreneur also launched a website by the name of ‘Khan Meter’ which was also directed towards monitoring the initiatives promised by the chairman of PTI, Imran Khan.